Then-U.S. Rep. Beto O’Rourke speaks at a town hall at Chapin High School in El Paso. VietPress USA (Feb. 9, 2019): President Donald Trump will come to El Paso on next Monday to rally for a border wall. At the same time, Democratic wunderkind Beto O'Rourke will lead a protest march and even the Trump Baby blimp putting in an appearance. The Trump rally at the El Paso County Coliseum will come only four days before the possibility of either another government shutdown or a declaration of national emergency over what Trump deems a national security crisis at the U.S.-Mexico border. According to the El Paso Times, former U.S. Rep. Beto O'Rourke, a potential rival for President Donald Trump in the 2020 general election, will speak during an event intended to outshine the president's El Paso rally. O'Rourke, who gave up his congressional seat in an unsuccessful effort to unseat Texas Republican U.S. Sen. Ted Cruz in last year's elections, made the city's safety and the need for immigration reform a major focus of his campaign. He is now weighing whether to enter the race for the Democratic presidential nomination next year, which if successful would likely pit him against Trump in November 2020. O'Rourke will join a march from Bowie High School, 801 S. San Marcial St., in South El Paso to the Chalio Acosta Sports Center, 4321 Delta Drive, near the El Paso County Coliseum, 4100 E. Paisano Drive, where Trump will have his campaign rally. The president's rally is scheduled to begin at the same time. Texas Gov. Greg Abbott and Cruz plan to be with Trump at his campaign-style rally, according to aides for the state leaders. O’Rourke said he sees Trump’s campaign rally as an opportunity for the city to take control of the narrative. “I think the president’s decision to focus on El Paso and his horrible demonization and vilification of immigrants, specifically Mexican immigrants, and his desire to make us afraid of the border can work to our advantage,” he said in an interview with the El Paso Times. “In other words, as he comes down here and as he referred to El Paso in his State of the Union speech, the eyes of the country are literally on us and will be even more so on Monday. “He’s offering us a chance to tell our story, and we’re going to take that chance, all of us,” O'Rourke told the Times. EL PASO — If American politics has turned into a three-ring circus, this city in west Texas will hoist the Big Top on Monday, with President Donald Trump coming to rally for a border wall, Democratic wunderkind Beto O'Rourke leading a protest march and even the Trump Baby blimp putting in an appearance. It also follows Trump's State of the Union comments in which he tried to use El Paso as an example of why the United States needs to construct a wall along the border. Perched on the U.S.-Mexico border, the city has become the focal point for the contentious issue of immigration and the president's relentless push for a barrier. O'Rourke, whose skillful use of social media has made him a national figure and prolific fundraiser, plans to join a one-mile march past Trump's rally on Monday and speak across the street from the president at about the same time Monday evening. 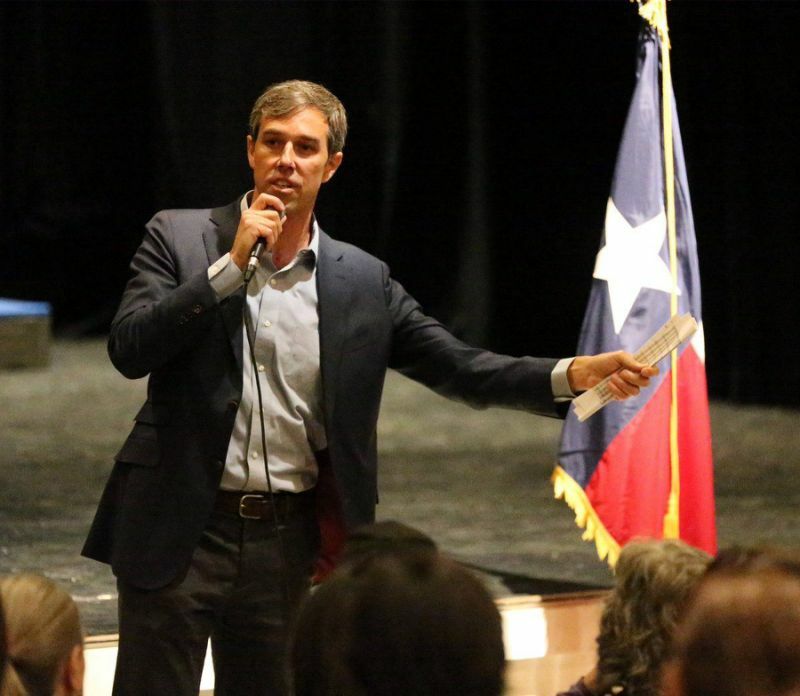 “He’s offering us a chance to tell our story and we’re going to take that chance, all of us,” O'Rourke told the El Paso Times. O'Rourke's camp described Monday's protest march as an effort to "show the country the reality of the border — a vibrant, safe, bi-national community that proudly celebrates its culture, history, diversity and status as a city of immigrants." The president triggered local anger by alleging in his State of the Union address that El Paso "used to have extremely high" crime rate before a border fence was constructed and that the rate of crime dropped substantially after it was completed. The statement quickly prompted blowback from local politicians and law enforcement figures. Even Mayor Dee Margo, a Republican, insisted that El Paso was "never" among the nation's most dangerous cities. Using Uniform Crime Reports from the Federal Bureau of Investigation, the rate of violent crime in El Paso can be calculated by combining data reported by the El Paso County Sheriff's Office and the El Paso Police Department. One photo, posted on Twitter by local TV anchor Shelton Dodson, features a Mexican food dish from a popular local restaurant chain, Chico's Tacos, with the caption. "The Only violence in El Paso was when Chico's changed its cheese." Dodson posted the photo with its own headline: "Well, that was a very frightening time in our city's history." Beto O'Rourke and Oprah Winfrey speak onstage at Oprah's SuperSoul Conversations at PlayStation Theater on February 05, 2019 in New York City. O'Rourke, a local political rock star who represented El Paso in Congress before narrowly losing a bid to replace Republican Ted Cruz in the Senate, hammered Trump during his campaign over the wall in particular, and immigration. Now, that he is on the verge of possibly entering a race for the White House, O'Rourke enters the fray with the same message. O'Rourke also planned to join Democratic Rep. Veronica Escobar, who succeeded him in Congress, and other activists on a conference call to denounce Trump's insistence on a border wall. In an interview in New York this week with Oprah Winfrey, O'Rourke called Trump's push for a border wall a "racist response to a problem we don't have. It seeks emotionally to connect with us, with voters — to stoke anxiety and paranoia, to win power over 'the other' on the basis of lies that vilify people."